The development of organic baby food started in 2009 and the first baby formula ready to drink was launched in spring the spring of 2013. The plan is for OTTO Baby food to also produce fresh smoothies snacks and dishes. The group behind the company has a background with a total of 150 years in the food industry with such brands as Oatly, Potato Specialist and Skånemejerier. Some of the key brands include the patented oat drink Oatly and the probiotic drink ProViva. The Food Academy, Livmedelsakademin, has supported the project during the development phase. OTTO development activities are conducted in the former Pharmacia facility at Ideon in the Lund area, while management sits in Stockholm. Production takes place at the Falköping dairy. The company has about six employees and is owned by Potato Specialist, Adventure, Innovation Bridge, and the Kreuger Nilsson and Rolf Bjerndells families and Mats Lönne’s personal company. Baby food is sold in Sweden every year for about SEK 1 billion. In many respects, the industry is very traditional and baby food jars look about the same as they did 50 years ago. Something that contributes to this is the requirement on child nutrition and food restrictions on additives and preservatives. Glass jars on the shelf in the store therefore contain canned food for years to meet food hygiene requirements. The same applies to powdered baby food. Cooked processed food is relatively easy to manufacture, store and transport, which probably means that the willingness to innovate is held back. The key words are fresh, organic and gentle heating when OTTO produces baby food. The interest for many consumers, including expectant parents, is how food is produced, transported, and what it contains, has increased. The interest in organic food and for home cooking from scratch seems to have increased. “New food trends are slowly adopted in the baby food industry, but now we think it is time for a fresh revolution on the baby food shelf,” says Mats Lönne, CEO and co-founder of the company OTTO Baby Food. “We are a group of enthusiasts who had previously worked in the food industry and decided to come up with new thinking about baby food. The key words are fresh, organic and gentle heating,” adds Lönne. “Ten years ago, I worked with Rolf Bjerndell at Skånemejerier and was involved in the development of baby food with probiotics, the addition of bacteria which are considered beneficial for the intestines. The product was called ProViva Baby but we were too early and the project was closed down. In retrospect we can see that we were right,” says Lönne. OTTO’s first product is fresh and ready to drink baby formula delivered biweekly directly to the parents of young children in Stockholm. Besides using such a product, subscriptions are available in some grocery stores in Stockholm. There are about 150 customers who subscribe to the service, and it happens that Mats Lönne’s son Otto (5 years) helps to distribute OTTO. He has given his name to the company, which has made his siblings a little jealous. 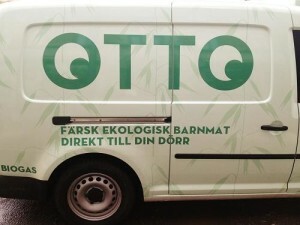 All baby food from OTTO is distributed in a biogas-powered refrigerated truck. “Our business concept is obviously not that Otto travels with the biogas-powered refrigerated truck, but it’s fun when he does. The concept is based instead on that our infant formula contains no preservatives or other additives, and is subjected to very careful heat treatment during production. The pasteurization means that microorganisms eventually grow again. The same thing happens with other dairy products, and in the same manner as with regular milk you notice the smell. Rightly kept, it can last for three weeks, “says Lönne. “We handle the entire cold chain (2-4 ° C) ourselves and thereby have direct contact with our customers, which is unusual in the food industry. The concept, product and design have been developed according to the principle of “open innovation” in close collaboration with our customers,” adds Lönne. 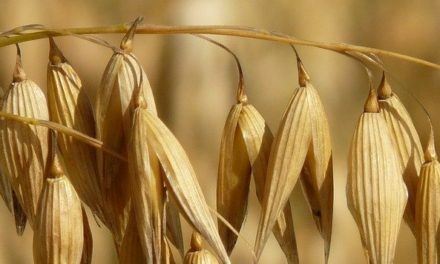 The ecological raw materials consist of oats and milk and are produced by farms in Västergötland. Corn is free of gluten and is unique with its content of beta-glutens, soluble fibers. The milk is fresh with natural fat and homogenized, not, like “old fashioned milk.” The content otherwise complies with the NFA guidelines and minerals and vitamins are added to the product. The gruel is made on a separate production line called the “Otto Line” at the Falköpings’s dairy. It is extremely rare with fresh industrially produced baby food in the world. “We have started with Stockholm, will continue in Skåne and are now looking at Copenhagen. A global baby food revolution would be cool. Sure, our product costs one penny more per serving, but fresh food for children can hardly be regarded as a luxury. How many adults eat industrial powder daily? Baby food should surely not be older than the child, “says Lönne.